Here is the next painting headed to the winter show at Twinhouse gallery. The show pieces are now being added to my website as each is completed. The site will also include contact information to the gallery for those who may be interested in making a pre-show purchase. The website also includes a link to Karens catalog of paintings scheduled for the show. If you think you may be interseted in the purchase of this piece you can click here for more information. I was originally planning on doing six 10 x 10's, but with the added time provided by the altered schedule, it looks like I may have nine or ten small paintings in addition to the larger Cherry Can. See you in a few days with the next installment. 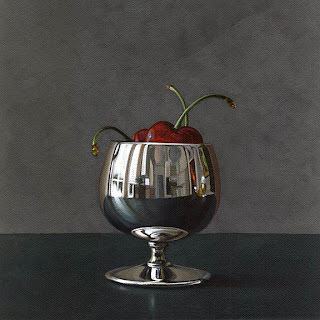 Thanks to all of you who left the encouraging comments on the Cherry Can painting. I was a little iffy about how it would be received at the Twinhouse show in February, but now am much more confident about that particular piece. Jim (you know who you are) thank you for your observations, and comment as well. I'm looking at my images a bit more closely now before I commit them to canvas. Above is the first of the 10 x 10's headed to the winter show at Twinhouse. I have three pieces relating to bread. Karen likes my bread, and convinced me to do some more. The date for the show has been pushed back until the 22nd of February, and so I'm going to try, and squeeze in a couple more of these 10 inch squares before the deadline. If I don't make it I'll still have the six, which I think is a respectable number inluding the 24 x 36 for a group show. 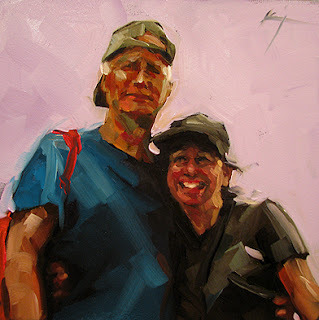 I'm sure that a lot of you who frequent this blog are fans of Karin Jurick, and may have seen this painting already, but Karen and I are so proud to have been "immortalized" by her I had to include the painting in this post. The image was taken from our trip to Asheville NC, to take part in the opening night reception of her show at 16 Patton. One amazing thing about this painting is that Karin started it just after we called her to say that we were on our way to her house to meet for lunch with her and Brett. The painting was complete by the time we arrived. She's something else. Karin has a spread in the January issue of American Art Collector magazine on newstands now. She is also painting for a show at the Howard/Manville Gallery in Kirkland Washington. The opening reception is February 9. You can see those works by clicking here. 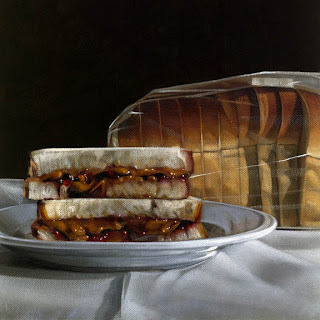 I haven't updated my website as yet to include the contact information for the gallery, if any visitors are interested in purchasing "pb&j no. 5". I should have that done in the next day or so. If you can't wait you can click on the Twinhouse link, and either call or email Tiffany. She can help you with that. I'll be spacing these new images out, with the final one posted a few days prior to the opening. I'll be back in a few days with the next painting. 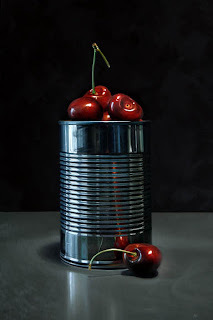 The can of cherries is finally finished. I don't know if it works or not. It didn't turn out like I'd hoped it would. I may have bitten off more than I can chew on this one. It took much longer to complete than I anticipated, and my cold didn't help speed things up any. Now I'm in a race to produce enough work for Twinhouse to actually call my contribution a "show". Fortunately it's a group show, which takes some of the pressure off. No more large paintings for the time being though. I've got six 10 x 10's drawn out, and if I kill myself maybe I'll be able to complete them all in time to hang in early February. It's not what I had planned, but the holidays, my illness and the riduculous amount of time I spent on the cherry can has rendered my original ideas moot. I'll post each of these small pieces as I complete them with links back to the gallery for purchase information. Wish me luck, because I'm going to need it.